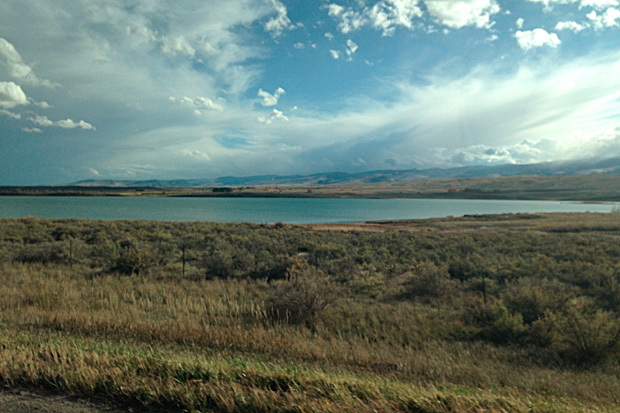 Over the past several years, the High Plains Regional Climate Center has been working with Native American tribes in the region to help address their on-reservation climate and drought vulnerabilities. In the Missouri River Basin, there are 28 tribes with a diverse set of climate-related challenges. Let’s step back for a moment and discuss why climate hazards may be different among the tribes. First, many of the rivers that flow through the region, like the Missouri River, are fed by distant snowpack from the Rocky Mountains. For places downstream, this makes surface water supply dependent on climate conditions that are relatively far away. In addition, the Great Plains is well-known for its extreme weather (tornadoes, blizzards, and ice storms) and climate (recurring droughts and springs with epic flooding). Finally, the Great Plains is marked by an extreme east-west precipitation gradient: locations in the east (closer to moisture from the Gulf of Mexico) can receive double, if not triple, the precipitation of places in the west. This gradient alone can lead to significant differences in the ways that people manage and allocate water. For some in the region, mountain snowpack is relied upon for water resources, while others rely on ground and surface water supplies. These inherent challenges, even without taking climate change into account, make a one-size-fits-all approach to activities like water resource management impossible. One project that I want to tell you about is with the tribes of the Wind River Indian Reservation. Located in west-central Wyoming, the reservation is home to two tribes – the Eastern Shoshone and Northern Arapaho – who depend on snowpack and glacier-fed meltwater flowing through tributaries of the Wind River for their water supply. Recent droughts have impacted the tribes, creating the need for climate and drought information that could help them become more resilient. Funded by the North Central Climate Science Center at Colorado State University, this project brought together a number of partners including our team at the High Plains Regional Climate Center. Our primary contribution was the development of an operational climate and drought summary for the Wind River Indian Reservation area that we produce each quarter. The Office of the Tribal Water Engineer uses the report to assess environmental conditions and make drought declarations on the reservation. Our staff took the lead on the development of the summary, and, with input from local resource managers, community members, and the project team, the summary went through several iterations to become what it is today (see the screenshot above). Current sections include: an overview of seasonal temperature and precipitation, a data table for specific weather stations, the latest drought conditions, the latest snowpack or streamflow conditions (depending on the season), reservoir information, and outlooks for the upcoming season. Once the format was finalized, staff members from the Office of the Tribal Water Engineer came to the University of Nebraska-Lincoln, where we’re located, to learn how to interpret the climate and drought information contained in the summaries and to be introduced to the wide range of underlying data sources, including NOAA, the U.S. Geological Survey, the Bureau of Indian Affairs (BIA), the Bureau of Reclamation, and university-based partners. The 2-day workshop also included hands-on training on how to assemble the climate summary, particularly with the inclusion of local water resource knowledge. The summary is currently being transitioned from our Center to the Office of the Tribal Water Engineer as the project comes to a close later this year. In preparation of this transition, we developed an online dashboard, which contains up-to-date resources that can be used for monitoring as well as incorporation into the summaries. As word of this work spread, other tribes in the Missouri River Basin became interested in developing their own climate and drought summaries for local decision-making. With generous support from the Bureau of Indian Affairs and the National Integrated Drought Information System (NIDIS), we have been able to expand this work to serve the North Dakota and South Dakota tribes of the Great Plains Tribal Water Alliance, as well as the tribes of northeastern Kansas/southeastern Nebraska. Each climate and drought summary and associated training session is tailored to the specific needs of the tribes. For instance, while snowpack is very important for the tribes of the Wind River Indian Reservation, groundwater is important for the Rosebud Sioux Tribe in south-central South Dakota. Additionally, the summaries can be used as a medium through which to share culturally relevant information, including climate change impacts on medicinal plants or language lessons for weather and climate terminology. Through our work with tribes, our staff continues to learn new ways to aggregate, translate, and communicate climate data in ways that are meaningful to our partners. Adapted from Climate.gov, and edited by Mace Michaels for WeatherNation.